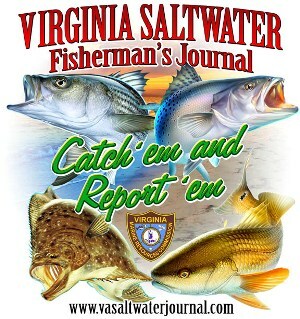 The Saltwater Journal has been used by recreational anglers since 2007. It is intended to benefit the individual angler, the fishing community, and fishery managers. It allows the individual angler to keep a record of their fishing experience that can be used to identify successful locations and conditions in the future. It allows the fishing community to share and learn about other anglers' experiences. Finally, it will benefit fishery managers by allowing them to assess fish populations by analyzing data provided by you, the recreational fisherman. Virtually every adult saltwater angler (16 and older) in Virginia will need either a valid saltwater fishing license or to register with the Fisherman Identification Program every year. This is part of a nationwide effort to collect contact information annually for everyone who fishes recreationally in the country's saltwaters. Doing so will help federal fishing effort surveyors improve their ability to contact anglers periodically and ask them how often they go fishing, where in general they go fishing and what they caught. You must register with the Fisherman Identification Program every year. This online reporting system is the property of the Commonwealth of Virginia and is intended for authorized users only. Unauthorized use of this system may subject you to State or Federal criminal prosecution and penalties. Please be advised that we have taken numerous security precautions to ensure the data that is entered in this system is secure. However, the VMRC cannot guarantee against all possibilities of security breaches or unauthorized accesss. You may opt not to use this system and can manually report your trophy striped bass, tilefish or grouper with forms found here. Recreational anglers and charter boat captains targeting Cobia or February Black Sea Bass are required to obtain the appropriate VMRC no-cost permits online or at a MRC license agent. These permits are in addition to you recreational fishing license requirements. Please report your mandatory recreational trips below. Mandatory trips are included in your Saltwater Journal.